This e-guide will feel supportive for art facilitators who are just beginning to offer classes and groups in their community, and who want to feel more comfortable with class pacing, program structuring, and communication with groups. 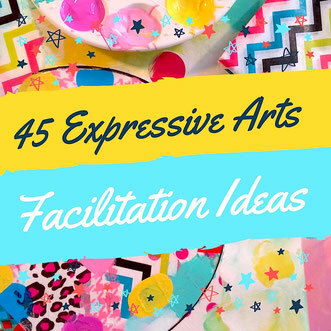 This guide offers 45 ideas that inspire participant self-development through expressive art, movement, and writing directives. For over 15 years I have kept detailed notes of all of the hands-on art directives that have worked well in my expressive arts classes for children, teens and adults, as well my work with a wide variety of special needs populations. Whether you are new to facilitating expressive art and writing for groups or are a seasoned facilitator, this e-guide will provide you with fresh ideas everyday that will help increase honest communication, encourage freedom in the use of art materials, build group bonding, and invoke the healing power of authentic creativity in a peer-led way that does not require counselling or therapy skills. 1. 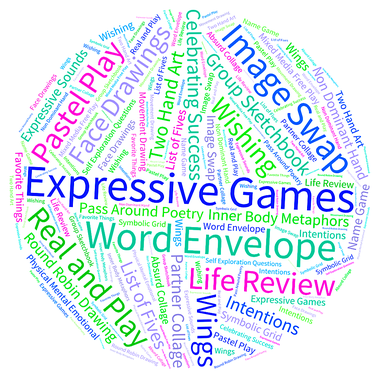 How to facilitate 45 multimodal expressive group exercises including authentic movement, expressive drawing, poetry, painting, collage and much more. 2. How to pace your art sessions to intensify the creativity of your participants. 3. How to introduce the element of surprise into your facilitation skills to increase spontaneity and fun. 4. How to facilitate group discussions that encourage honest sharing and friendly group communication.